It says it all doesn't it? Add the iphone, the ipad, the internet, the tv, and we are pushed further into our little circle of security, our homes, and even that, in today's world, is no longer safe. In the meantime, outside our safe delusional safe circle, they are slowly taking away what we use to take for granted, our freedoms, our money, our sense of individuality. And most of us aren't even noticing, because we believe to be safe in our little circle, but when they are done outside, they will come, inside. One evil woman, the product of feminism. Scientists predicts time of death? Ya right! Patriarchy and the return of man. A little at a time, Dads are making an impact. 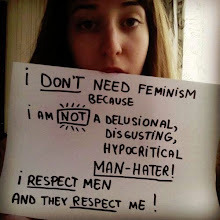 Today' feminism, a lesson in deceit.